Conservatories are quicker and cheaper than full-blown extensions and they tend to not need planning permission, so they’re a popular choice when it comes to extending. But is a conservatory right for you? And what do you need to know before you start? Embarking on any home extension project is as nerve-wracking as it is exciting. Perhaps the new space won’t look as good as you expected, or you won’t use it enough to justify the considerable upheaval and expense. 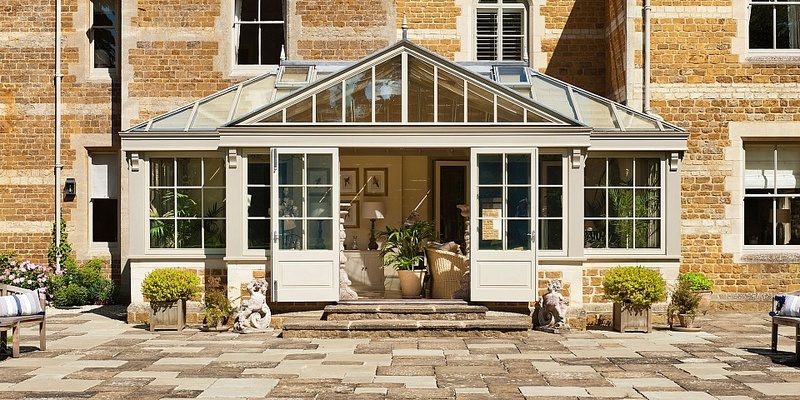 If you’re thinking of building a new conservatory, don’t let those concerns put you off. We’ve surveyed more than 100 conservatory owners* to find out why they had them installed and whether they had any regrets afterwards, so that you can make the right decisions from the start. Should I buy a conservatory? Whether you’re replacing an old conservatory or starting from scratch, it’s better to get your new room right first time and come away feeling content, not disappointed. We asked conservatory owners if there’s anything they wish they’d done differently, so that you can learn from their mistakes. A third of the people who admitted they’d change something about their conservatory mentioned self-cleaning glass. It works using a special coating that reacts with sunlight to break down dirt, which is then washed away by the rain. Benefits include saving time scrubbing hard-to-reach panes and keeping maintenance costs down. We’d only recommended self-cleaning glass if your roof will be steep enough, as it relies on rainwater carrying dirt away. Head to our common pitfalls guide to find the right roof pitch and angles you’ll need. In addition, 16% told us they would use anti-glare glass if they were doing their conservatory again. 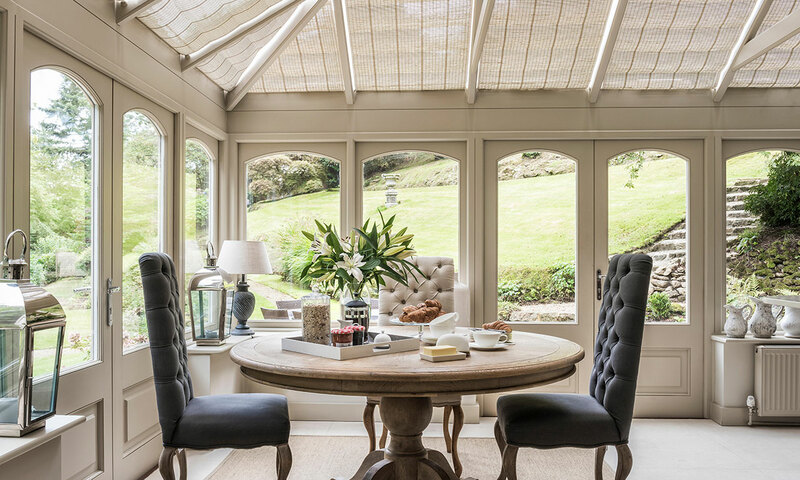 To find out more about the different types of glass and other ways to prevent glare, head to our guide to types of conservatory. Of the conservatory owners we spoke to who weren’t completely happy, 28% wished they’d chosen a bigger conservatory. A bigger conservatory can cost more, take longer to build and might need planning permission, but the extra time and effort could pay off if you then use the room more once it’s finished. If you’re wondering how big to go, start by measuring out the dimensions of your future conservatory in your existing living or dining room. It’s easier to visualise the new space compared to an existing room, and you’ll be able to see whether your furniture will fit. Early on, think about where you’ll position doors, electrical power points and TV aerial sockets so you can get maximum use out of your new conservatory, as these things are hard to change down the line. 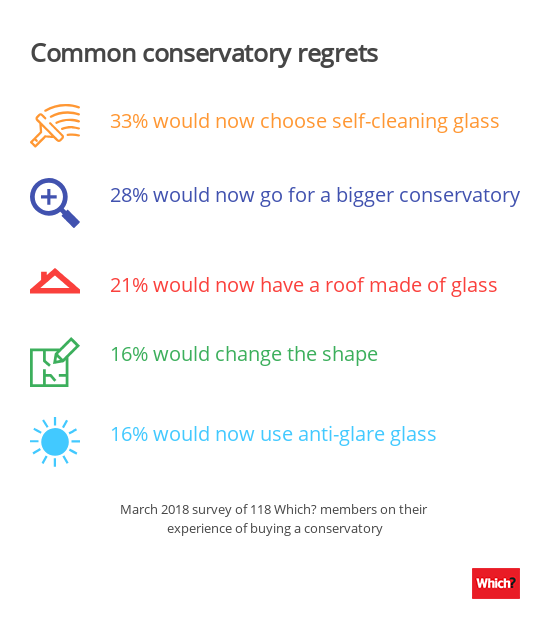 A fifth (21%) of people regretted their polycarbonate roof and wished they’d chosen glass instead. While they’re pricier, glass roofs are more thermally efficient than polycarbonate, and let in more light and less noise. If you can afford it, it’s probably worth the extra expense. Visit our conservatory prices page to learn more about glass and polycarbonate conservatory roofs and discover which option might work for you. 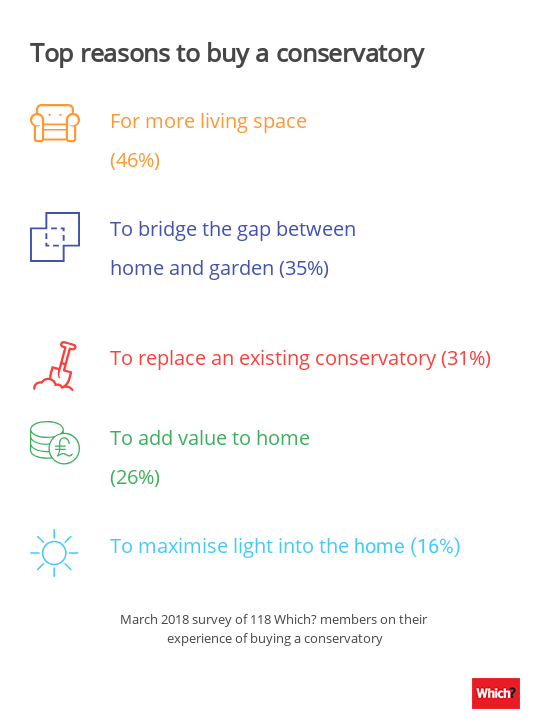 Some 16% of people we asked said they wished their conservatory was a different shape. One person said an ‘L’ shape would give them access from the kitchen as well as the living room. Before you begin, think through all the different ways you hope to use the new space and how it will connect with the rest of the property. 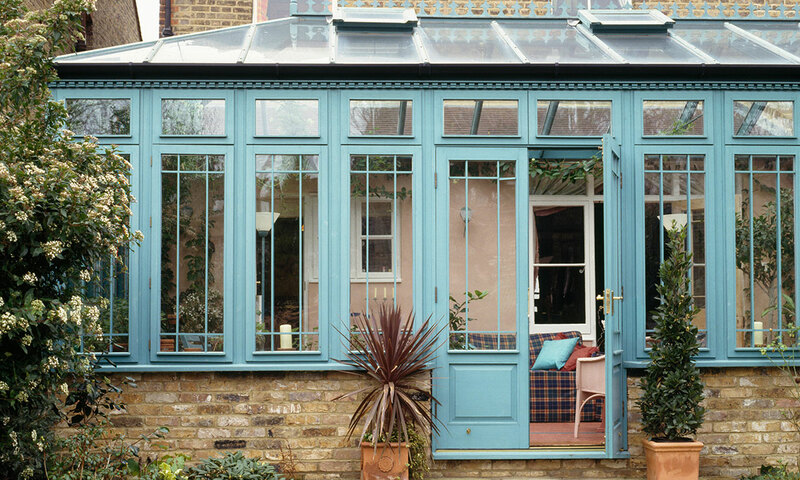 There’s a trend to build a conservatory that opens up the back of your home, creating an open-plan shape. For this type of build, you’ll need to think carefully about thermally efficient materials and planning good heating and ventilation. 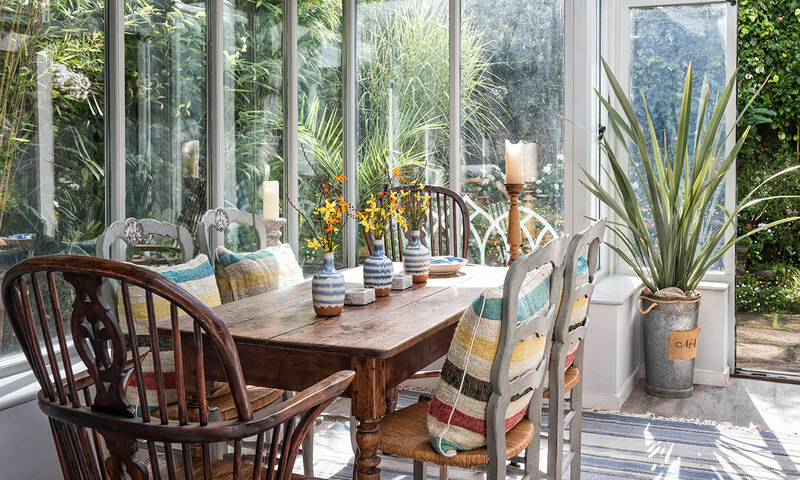 Before you begin your build, download our handy conservatory checklist. It covers all the major questions you’ll need to ask, from getting a quote to construction and access. Look for a company that’s been established for a few years and check reviews beforehand. Head over to Which? Trusted Traders to find reputable builders in your local area. For more information, visit our conservatory guide for advice on choosing a conservatory company, types of conservatories and conservatory costs.